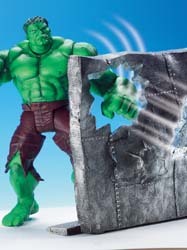 The Hulk movie opens in UK cinemas in July and already the spin-off toys are being promoted. Now, this is something I have been wandering about for some time. In my youth, movie merchandising wasn't usually available until the movie was a guaranteed success and then the market was flooded with items. These days toys, and extremely well constructed and detailed ones too, are being produced as the movie is still in production. So what happens when the movie is a flop? Heaven forbid that will happen to the Hulk. But Toy Biz are taking a huge gamble here. The detail that has gone into this figure is pretty impressive and this is certainly a product that will appeal to both the young, who want to recreate scenes from the movie, and the adult collector, who just want a well designed collectible item. The punching action used here reminded me of two old Batman and Robin action figures I had as a child and that's what made me realise how simple these toys are. It even has a lever at the back to make the Hulk's arms go up and down (the old Batman and Robin dolls lever allowed them to punch - sort of). It's the same basic design that has been used for years, but with much better likeness of the characters. But then, if it ain't broken, don't fix it. This basic design has proved itself over the years and it allows children to become more animated in their playing - what use is the Hulk if he doesn't stomp around waving his arms around? The packaging for this product is also of a high standard, with the Hulk seemingly inside a gamma radiation chamber waiting for you to help him burst out. Whether the movie is a hit or does terribly at the box office, one thing is certain kids won't be disappointed by the official toys on offer. I'm almost green with envy that I am not a child again.